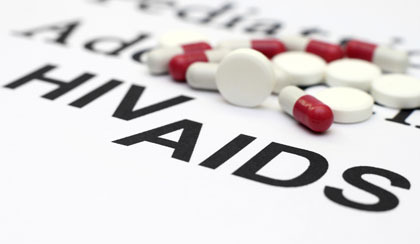 Preliminary findings from a study funded by the the National Institute of Allergy and Infectious Diseases (NIAID), part of the National Institutes of Health (NIH), indicate that HIV-infected individuals have a considerably reduced risk of developing AIDS or other serious illnesses if they initiate treatment with antiretroviral medications when their CD4+ T-cell count is higher, rather than waiting until this cell count drops to lower levels. The Strategic Timing of AntiRetroviral Treatment (START) Study was conducted at 215 sites in 35 countries and enrolled 4,685 HIV-infected patients aged ≥18 (median age 36); participants were followed for an average of three years. Participants were treatment-naïve for antiretroviral therapy and had CD4+ cell counts in the normal range of >500 cells/mm3. The patients were randomized to receive antiretroviral therapy immediately (early treatment) or when their CD4+ cell count reduced to 350 cells/mm3. Measures outcomes included serious AIDS events (such as tuberculosis and AIDS-related cancer), serious non-AIDS events (major cardiovascular, renal and liver disease, and cancer), and death. The early treatment group showed a 53% reduced risk of developing serious illness or death compared to the deferred treatment group. Rates of serious AIDS-related events and serious non-AIDS-related events were also lower in the early treatment group vs. deferred treatment group and the risk reduction was more pronounced for the AIDS-related events. The results were consistent across geographic regions and the benefits of early treatment were similar for participants from low- and middle-income countries and participants from high-income countries. The START trial is the first randomized controlled trial to show that antiretroviral therapy can benefit all HIV-infected individuals and supports the current U.S. HIV treatment guidelines that recommend antiretroviral therapy for all HIV-infected individuals, including those who are asymptomatic. Current World Health Organization (WHO) HIV treatment guidelines recommend that antiretroviral therapy be initiated when CD4+ cell counts fall to ≤500 cells/mm3. The study is expected to conclude at the end of 2016, but based on the data all participants will be informed on the interim results and offered antiretroviral therapy if they are not already taking this medication. Participants will continue to be followed through 2016. For more information visit NIH.gov.